Collective for Youth offices have moved to a NEW location in the SAME building! Lucky us, we also got to keep our suite number! Feel free to stop by to see our new digs! We are excited about our new training room and office space. Enter at the main front entrance of the Park Plaza building at 105 North 31 Avenue. Our office entry is towards the left of the lobby entry way. Directional signage coming soon! In May, Collective for Youth challenged our stakeholders and friends to help us raise $10,000 through Omaha Gives presented by the Omaha Community Foundation. Thankfully, we smashed our goal by raising $11,275. Smashing our goal was possible because of amazing supporters like you. Thank you for going the extra mile to help us be successful. The funding we raised will help us purchase technology for our new multipurpose room. Click here to view the most recent summary report of the Train to Gain Quality Improvement initiative. Collective for Youth is proud to be in the Every Hour Counts network! Head over to their new website at www.everyhourcounts.org to see how cities all over the country are building Expanded Learning systems for their young people. On their website you can find systems building resources, & more. Gwyn Williams’ BOOST Afterschool conference session in Palm Springs, California was the highlight of the month for her!. Every table and every seat was filled during the session. Participants discovered the crucial role OST program play in developing youth skills around teamwork, problem solving, resilience, self-confidence, connections between social emotional learning and STEM, then fuse them together. Fusing our efforts save staff time, more logical, and more effective for youth. OST programs working more intentionally to integrate their efforts around STEM and Social Emotional Learning develop better-prepared youth. The objective of Gwyn’s workshop was to investigate the correlations between social emotional learning and STEM. According to the research findings, STEM and social emotional learning were found to connect positively. Creating a safe and engaged environment in which these programs are applied, decreases students’ risk taking behavior, and supports their personal development positively (CASEL, 2003). There is a significant correlation between social emotional learning and academic success. STEM covers four specific educational areas: science, technology, engineering and math. SEL focuses on the softer side of development and emphasizes social and emotional learning. Both STEM and SEL are crucial and relevant right now in the world. Organizations are developing curriculum, training, and evaluation tools to meet the demand. Research from Carol Dweck in her book titled “Growth Mindset” have helped illuminate the important role OST programs can play in developing student skills around teamwork, problem solving, resilience, self-confidence, communication and leadership. However, for OST groups with limited staff time, budgets and capacity, it would be much more effective and compelling for students if we could integrate our efforts in both areas instead of creating unnecessary silos. When OST programs work more intentionally to integrate their efforts around STEM and SEL, then students will be better prepared to handle whatever opportunities, challenges and decisions come their way. Collective for Youth received the Nebraska Extended Learning Opportunity Grant that provides funding for three middle schools and fourteen elementary schools on four areas of focus. These four areas are engineering, agriculture, creative arts, and social emotional learning. Collective for Youth collaborated with Infinite 8 Aeronautics to facilitate the training and their emphasis were engineering and technology. The sites involved in the two days of drone training were Castelar Elementary, King Science Middle School, Highland Elementary, Lothrop Magnet, Howard Kennedy Elementary, Miller Park Elementary, and Franklin Elementary. The first day covered classroom instruction and the second day concentrated on how to control and fly the drones (Flight School). The sites were trained on how to implement a 10 week curriculum in drone technology, entrepreneurship, aerial photography/videography, and how to create a business model. The sites received the “Dronetrepreneur” curriculum, three drones each, flags, and cones to take back to their sites. The highlights of the training were observing the Site Directors create their business models, flight school, researching the various careers, and salaries for drone pilots. Collective for Youth and our partners are very grateful for this Extended Learning Opportunity ! Collective for Youth is offering a two-day Summer Institute program this summer at the Barbara Weitz Community Engagement Center located on UNO’s campus at 6200 Dodge Street. 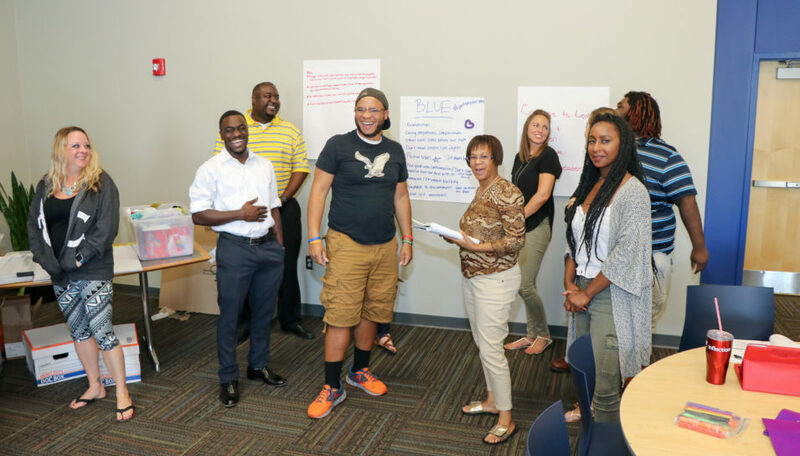 This 2-day training on July 30 and 31st will help out of school time professionals in “Building You,” “Building Culture,” and “Building Your Program.” The training will be facilitated by Gwyn Williams, Program Director at Collective for Youth and LaRon Henderson, Program Quality Director at Collective for Youth. Click here to learn more about the Summer Leadership Institute. Register today! Our Youth Work Methods Series is a 10-part skills building workshop designed by the David P. Weikart Center to empower staff with tools that will increase the quality of their work with youth. Each workshop is open to anyone who is currently working with youth or desires to work with youth. Certification is available to those who complete each segment. You may attend the entire series or only the sessions that apply to your interests and needs. Click here to register for the 2018-19 season of upcoming Youth Work Methods workshops workshops! Seats are limited and registration is required. Drop off school supplies at any Omaha First National Bank branch July 16 – August 8. Or come join us along with WOWT, Two Men and a Truck and Collective for Youth to “Stuff the Bus” on August 8 at our First National Bank branch located at 132nd & Center from 5am – 7pm. Please join Collective for Youth and our partnering agencies for our annual Lights On Afterschool celebration at the Sapp Fieldhouse on UNO’s campus on October 6, 2018 between the hours of 10 and 2 p.m to celebrate Lights On Afterschool. This event will highlight the activities and the providers that are in all 31 of CFY after school programs on each school day between the hours of 3 and 6 p.m. This event is free and open to the public. Lights On Afterschool is an annual event that takes place in hundreds of locations throughout the country. These events highlight the importance of high quality afterschool programs and the youth who attend them. Each year, CFY has hosted this event with great success. 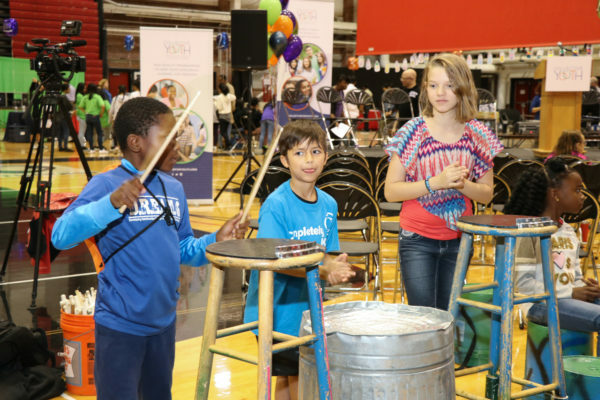 Over 1500 youth and adults gather to enjoy lunch, hands on activities, community exhibits, parent activities, and performances by local talent and youth from various afterschool programs in the community.